-free diet to prevent heart disease propaganda that was fed to us since the 60s was just that. ary fat is a common topic. I’ll answer simple questions of “this over that” and when I mention cooking with butter and animal fats, I get the raised eyebrows followed by impulsive questioning — this can lead down a rabbit hole quite fast. I was searching through my Practical Paleo book the other day for a particular recipe my family enjoys, and I came across the “guides” section in the back of the book. 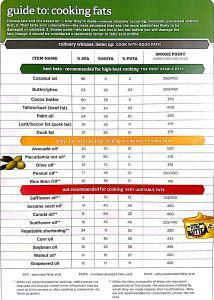 I found the guides for fats & oils, as well as what fats are best for cooking, which prompted the topic for this week’s Friday Findings! The images are hard to see here, so download, print these bad boys out, and keep them in your kitchen. Why should you stop consuming those once thought of “healthy” vegetable oils? Simply put, they are highly processed and refined products that or foreign to nature and our bodies. Refined oils are unstable and oxidize by air, heat, or light quite easily. Anti-oxidants are healthy, right? It’s because they negate free radicals in our bodies that are produced via oxidation. Free radicals cause inflammation. All of the modern diseases, e.g., heart disease, diabetes, cancer, that affect us monumentally today are rooted in inflammation. I’ve already mentioned rabbit holes, and now we’re starting to burrow, so let’s keep it light, but heavy on the naturally occurring fats! We’re not smarter than mother nature, yo!